November has been a very stressful month, and it’s not over yet. Some of the stress has been in a good way, so I’m grateful. I’m grateful for having the opportunity to speak at the Minneapolis Women’s Club at the Women of Words event. I’m also grateful to have the opportunity to speak to our local Ostomy Society. What a great bunch! I’m grateful to the people at both presentations who took the time to tell me exactly why what I have to say had such a strong impact on them. I’m grateful, as always, for my time at Gilda’s Club. I’m putting in an extra shift this week, stepping in for another greeter. Since Thursday is my usually day I’ve got a “day off” so I suppose it’s not really extra. Besides, there’s a social event this morning so I would be there anyway! I’m grateful that I’m not hosting Thanksgiving. The family I grew up in has two generations under it. I’m a Great Aunt. The crowd is getting too big for us all to be together in one space. It’s bittersweet to break it up. At the same time I’m grateful for the opportunity to spend a little more intimate Thanksgiving rather than all the noise and chaos. I’m grateful, especially after this summer, to still have both of my parents. I’m grateful both of my children will be there. I’m grateful for all the things I say I’m grateful for in my speeches. Telling my story means I am revisiting points in my life where I had reason to be very grateful, for people, for circumstances, for support. It’s challenging for me to open up that way, but it’s also a great reminder of how blessed I’ve been. I’m looking at the Syrian refugees. I’m looking at the shooting (by the police) of a black man just a few miles from my home that’s threatening to turn Minneapolis into Ferguson. I’m looking at the bombing in Paris. I have so much to be grateful for, so much bounty, so much privilege, even my stress seems minor in comparison. So I give thanks and stand in gratitude and pray for healing around the world. Remember, it could be worse! You might recall last Monday when I thought I had too much to do and not enough time to do it? Today is the day. I have rearranged my schedule to be a little more comfortable. One of the things I didn’t move was a trip to the dentist. I’m not one of those people who fears going to the dentist. I’ve got a pretty high pain tolerance and have been fortunate in the people who’ve worked on my mouth. In spite of all that I don’t want to go. This is all about “I Don’t Wanna”. The appointment is for a cleaning. No drama, no pain, just a sparkling smile at the end of the day. I’m spending the morning pouting and dragging my feet. I have no excuses. I can pretend it’s because it’s a rainy day. I can pretend it’s because Orion’s bus was late. I can stand in solidarity with France. That’s not what this is about. This is about having to adult. We all have moments when we just don’t want to have to be the grown-up. Adulthood is not everything we dreamed it would be when we were kids. Yes we can eat when we want to, if we can afford it, cook it, and clean up after it. Yes we can stay up as long as we want, and drag ourselves to work the next day, and sometimes the day after because “catching up” isn’t as easy as it used to be. Thing is, we have also learned that it takes more effort to whine and fuss than it does to just do the thing. Get it over with and move on. Put a carrot (or a donut, or a good cup of coffee, or a cocktail) at the end of getting it done. We KNOW this, but it doesn’t always show in our actions. So I’ll go to the dentist and get on with the rest of my day. I’ll be grateful for a clean fresh mouth. I’ll try to stay focused on the things I like about getting up and on with my day. I’ll remember how nice it is to run my tongue over smooth clean teeth. I’ll think about what I might like for a treat. I am not this woman anymore. Taking care of myself needs to mean something different! I don’t know what day it is. I’ve been running so fast trying to keep up, to catch up. With the holidays approaching I know it’s only going to go faster, so I am looking for balance. I was sure that today was going to be one of those days when I didn’t have time for anything. I had too many appointments, too many commitments. I’d meant to make some calls and move things around, but never got around to it. Panic! Then I looked at the calendar again this morning. There’s that button that says “today” and makes the cursor go to the current schedule. Seems like the crazy Monday is NEXT week. I still have time to make those phone calls. I have different things to do today, and no so many. I can do this. This week my goal is to try and stop compartmentalizing my life. I get into trouble (too much to do) when those compartments start bumping into each other. Maybe if it was all one thing it would be easier to keep it all straight. I’ve got a lot of projects in the works. I’m doing some more speaking. I’m planning an interfaith ritual as part of my post Parliament commitment. I’m finishing up a year’s book work for a non-profit and stepping up to head the board. I’ve still got students in my Wiccan tradition. I’ve still got Orion, his annual meeting is this month. I’ve still got Gilda’s club, and my women’s group and friends I need to check in with. I’ve got another book to write! Sometimes when there’s a lot on the plate, something has to go. This time I’m still finding myself in the habit of conserving. I’m not really pushing my edges physically at all. I think maybe, what I need to finally let go of, is my fear of not being able. I’ve spent so many years being physically cautious. I’ve had to have the energy when I needed it and so have always tucked away a little extra when I could. I’ve paced myself physically, insisting on lengthy breaks between tasks. It really was necessary. When I couldn’t do that I’d end up in bed for a day, or days. I’d do too much and then really hurt myself. Now I can do so much more, and I’m excited and grateful that I can do so much more. But I still find myself being cautious, taking breaks I don’t really need. I avoid taking on large projects because I’m not sure I’ll be able to finish them. What has to give is this fear. It’s time to fly. When I hit those edges I’ll know. When I need to take care of myself, I’ll know. When I need to just stop and come back another day, I’ll know. I may not be able to do it all, but I can do it. It will be fun. 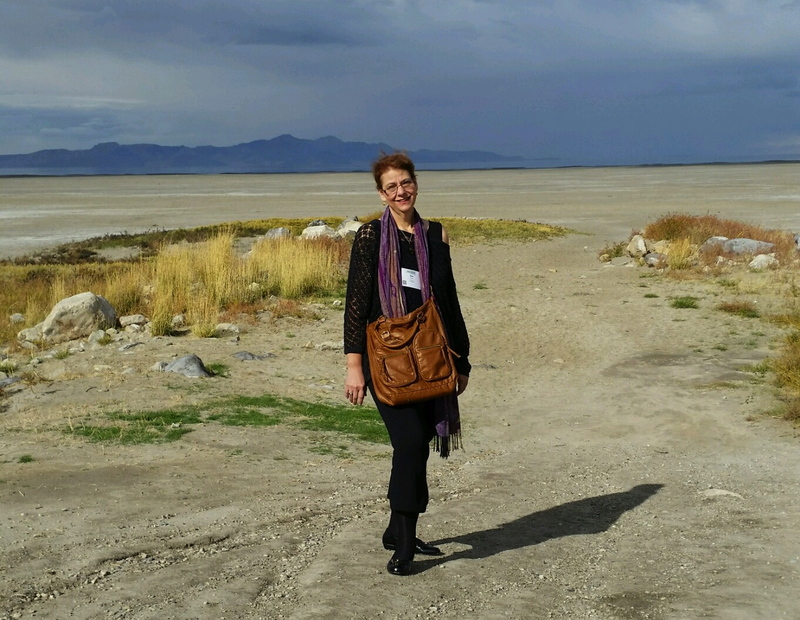 This was not only my first time at the Parliament of World Religions, it was also my first visit to Salt Lake City. I had to sneak away and check out the area. I was fortunate to have a chatty, tourist friendly driver from the airport. I learned that Salt Lake sits between two mountain ranges on the Western edge of the Rockies. That feels like being in a big comfy bowl surrounded by mountains. Salt Lake is a planned city. Streets are on a grid and an address will tell you how many blocks north/south and how many blocks east/west of the center point you are. Apparently there is an old law that says all streets have to be wide enough for two full oxen carts to comfortably pass. That makes for wide streets, and “alleys” that look to be the size of residential streets anywhere else. (They run the light rail down one of those.) So when something is two blocks away, it seems a bit further than you’d expect. Standing in the lake bed. It’s hard to see the water in the photo, but it’s out there. In spite of that Salt Lake is a very walking friendly city. Streets are clean, sidewalks are smooth and you can hop on public transportation pretty easily. At the convention center there were always bicycle rickshaws available. At the end of the day, the small fee for a ride back to the hotel was well worth it! Salt Lake also has a broad “rent a bike” program, so if you wanted to peddle yourself it was an option. I couldn’t stand the idea of being in Salt Lake City and not seeing the lake. I didn’t have time to take a tour bus out. The Lake is a good 10 miles out of the city (beyond the airport). I did manage to find my way along with a nice cab driver who was happy to get out with me and snap a few photos. There is quite the drought, and the lake bed I’m standing in should be filled with water. I did see the lake in the distance and was impressed and appalled. We’ve been hearing about drought conditions in the SouthWest and in California for years. This visual really brought that home to me in a new way. I didn’t have to ditch the conference for all my tourism. The Parliament arranged an evening of sacred music and dance. 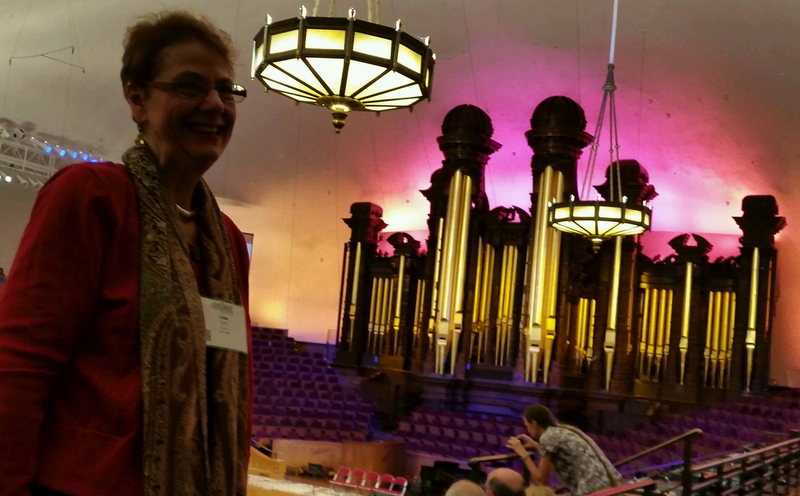 It was hosted by the Church of Jesus Christ of Latter Day Saints and held in the Mormon Tabernacle. This was a real treat. 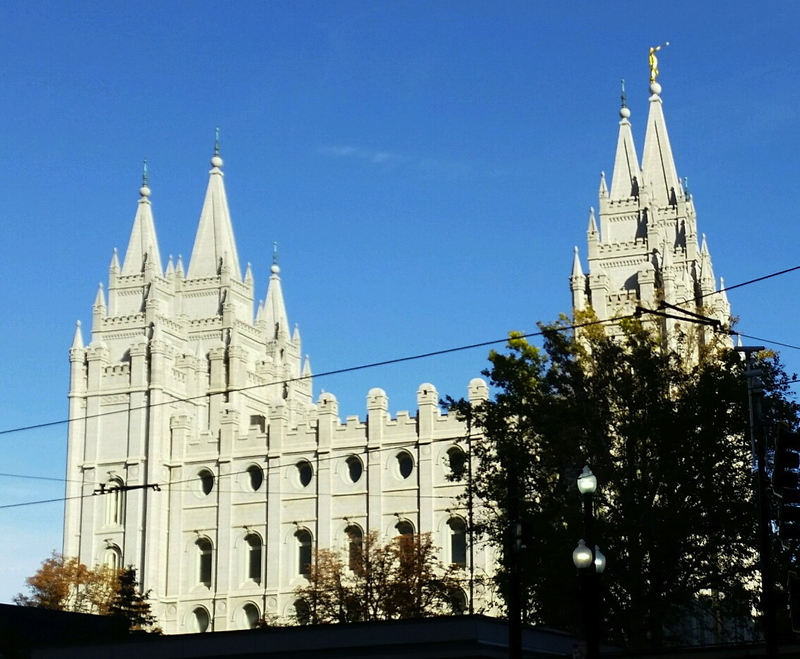 The Mormon Temple is not open to anyone outside of the religion, and then only for special services like weddings and rites of passage. Most things take place in the Tabernacle. It’s smaller than I expected. The woodwork, the pews, are all handcrafted and painted to look like oak. The organ that dominates the altar is magnificent. The place only seats about 5000 (more if you seat people in the choir, and they did!) I got there early and still chose a seat in the balcony rather than sitting way in back on the main floor. 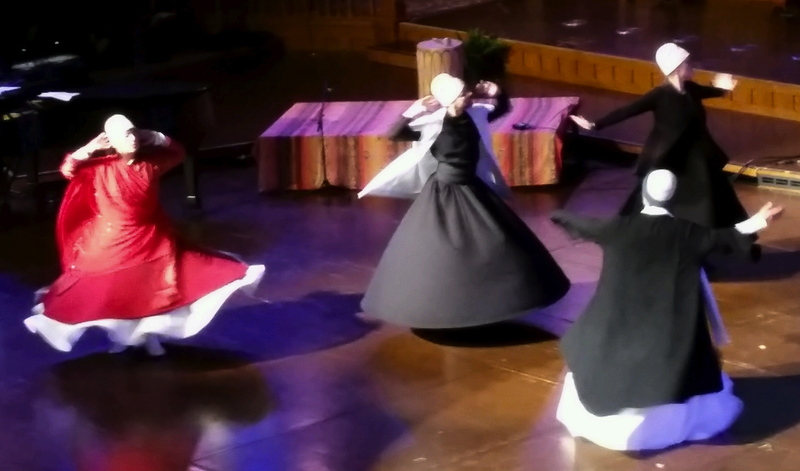 We were presented with everything from a Muslim call to worship to the Dervishes whirling. 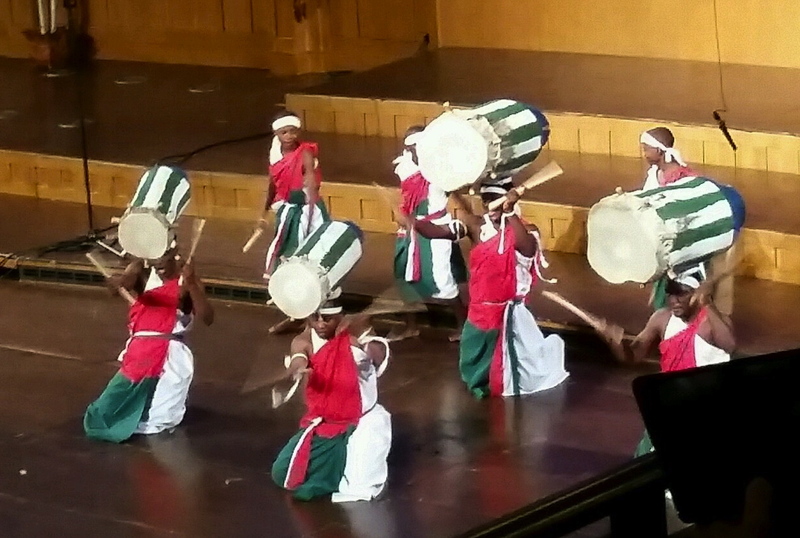 We saw dances from Cambodia and drummers from Africa. One of the highlights was a children’s choir made up of children from many different religious traditions. A delightful surprise was the Baha’i choir which gave us a piece based on their liturgy but in a gospel style. Temple Square is the center of the Mormon presence in Salt Lake City. It includes several visitors centers with museum dioramas of the history of the building of the temple. There are also plenty of dioramas of the history of the religion. 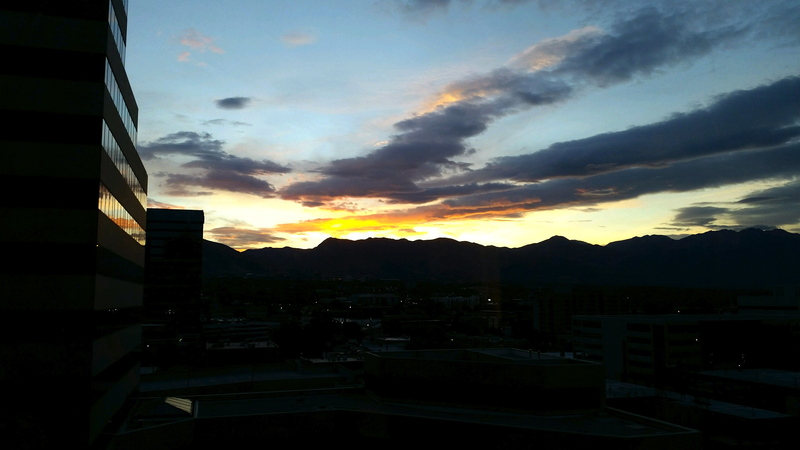 There are other things to do in Salt Lake as well. One evening we were encouraged to go on an Art Crawl (apparently a regular monthly affair in the city). 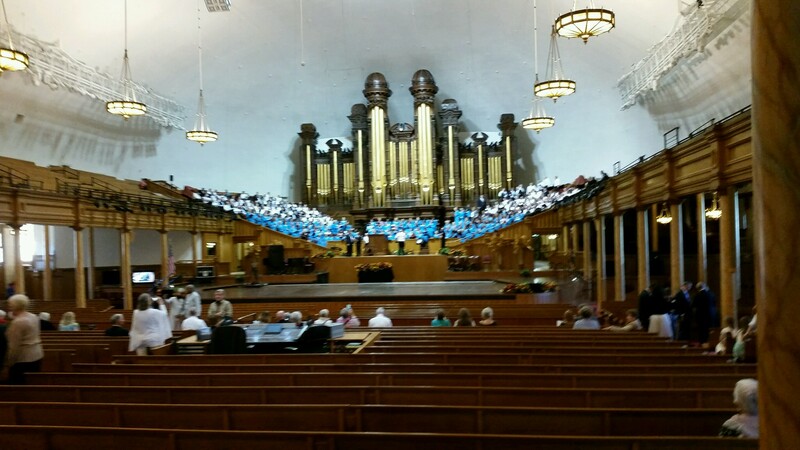 The Jazz Society rehearsals are open as are rehearsals for the Mormon Tabernacle Choir. There are several Art Museums in the area around the convention center. I had a great time. Really enjoyed the Parliament and all it had to offer. Truly appreciated the host city and it’s amenities. I’m hoping I’ll be able to go to the next Parliament of World Religions in 2017.